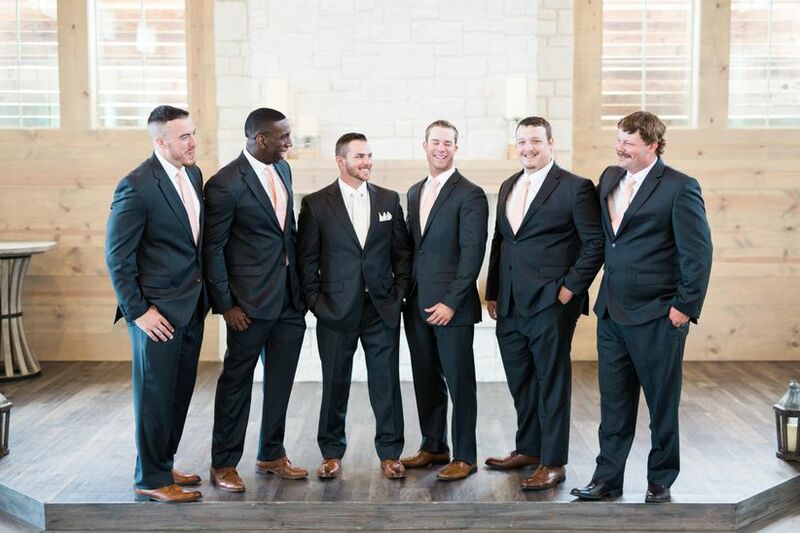 Groom vs. Groomsmen: Who Pays for What? Study this list and share it with your groomcrew so everyone has an idea of what they’ll be spending—and do it early on, so the bros can save up if necessary. The easiest way to avoid any financial freak-outs? Study this list and share it with your groomcrew so everyone has an idea of what they’ll be spending—and do it early on, so the bros can save up if necessary. As with bridesmaids, the rule is, you pick the look, and they pay for it. But usually, this process is a lot simpler (and cheaper) than bridesmaids attire, as it’s often rented. 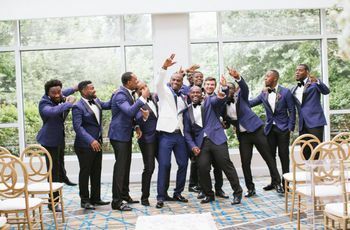 If you choose to go the rental route, simply make arrangements at the suit shop of your choice (choose an online rental service or national chain if the groomsmen hail from all over), then tell the group where to go, when to go by, and the approximate price of their rental. When you make the arrangements, you’ll pick out everything from their suits to their shirts to their accessories like ties and even shoes if the shop offers it, so they won’t have to worry about added costs elsewhere, unless you decide to mix things up. 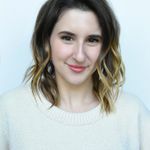 If your heart’s set on gingham shirts or tweed ties, you probably won’t be able to find those in the rental catalog—and that’s where things get tricky. 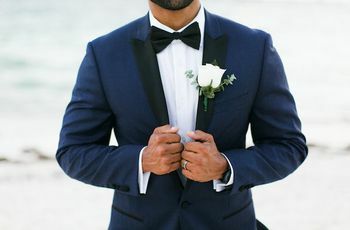 It’s up to you whether you want to shoulder that cost and give them as gifts to the groomsmen (since it’s your and your future spouse's decision to make that costly tweak, not theirs), or simply send your groomsmen links to the exact items they must buy and ask that they purchase them along with their suit rentals. Keep in mind that the more variables you add into the mix, the higher the chance of something going wrong (either someone ordering the wrong item, or something shipping too late, for example), so my advice would be to order everything together yourselves, and, if you’re not up to covering the cost, asking the groomsmen to pay you back after the fact. This is the big one! Guys, consider yourselves #blessed: While you only have to throw one party, your lady counterparts have to throw this one plus about 17 others. In any case, this is the groomsmen’s time to shine, and, depending on the location and itinerary, things can get pretty costly (and rowdy). 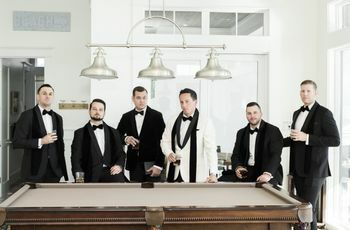 Traditionally, the groom himself would pay nothing, and his portion would be split evenly among the groomsmen, but that rule (thankfully) has softened in recent years, since bachelor parties have evolved into multi-day, destination affairs. 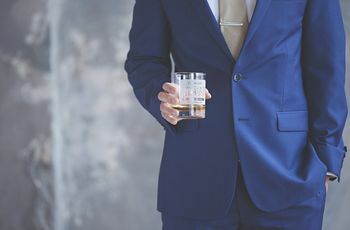 So, while the groomsmen might not be ponying up for your airfare and hotel stay, they should expect to be paying for their own, and covering most of your food, drinks and entertainment throughout the party (whether it’s one day or several). Luckily, they’ll be so psyched to have their one last hurrah with you, they’ll probably have no qualms with throwing down. Still, if you want to ease the sticker shock for all parties involved, consider staying away from hotels in major cities and opting for an Airbnb near some great hiking trails, a camping trip, or just a really great staycation where most of you already live. This is another one where, yes, if you got it (meaning, the money), you and your future spouse can help your wedding party out by covering their travel and boarding costs during your wedding, but traditionally, you’re not expected to. And if you guys are opting out, just make that clear when you’re asking your groomsmen to join the wedding party, so they can build the anticipated costs into their personal budgets. To help them save some cash, you can check to see if your designated wedding hotel offers room blocks and discounts for members of the wedding party—or you could contribute a percentage to their trip as a token of your thanks. And, to sweeten the deal, make sure they know you’ll be handling most of their transportation and food once they arrive—because, yes, those are a few of the perks of being in the wedding party! Here’s another instance where the tab for the guys will definitely be lower than the one for the girls—and, as a gift to the groomsmen, it’s a nice gesture for the groom to cover the cost of a pre-wedding shave and hairstyling. Not to mention, it’s also a favor for the two of you, as you’ll both want the squad to look their sharpest for your big day (and your wedding pics!). Note—you can skip this step, let the dudes come as they are, and save some cash, but a trip to the barber shop is a great chance for some pre-wedding, groom-groomsmen bonding, and the investment might be much more affordable than you think. And that pretty much covers it. Did I mention the dudes tend to spend less than the chicks? Oh, and don’t forget, it’s customary for the groom to buy his groomsmen gifts of gratitude prior to the wedding day, so make sure to build the cost of those into your side of the budget as well. They don’t have to be crazy expensive, but you shouldn’t be focused on penny pinching when it comes to these gifts, either—after all you’ve spent on every other aspect of your wedding, thanking some of the most important people involved should not be an afterthought (or a bargain hunt). Of course, no matter what you choose as gifts, you should rest easy that your bros are going to be happy to be involved with the best day of your life regardless, even if they have to drop some cash in the process.